Below are some baby nurse testimonials and reviews from our happy clients! Please contact us for any references. Want to share my experience with our wonderful night nurse, Jerry Lee. Jerry came to us as new parents, and on our first night home from the hospital, we were tired, overwhelmed and honestly clueless about how to care for our new baby. She quickly went into action and advised us on how to give a sponge bath, soothe and dress our little boy. I also was having trouble nursing and she encouraged me to not be discouraged about the breastfeeding journey and ultimately worked with me to develop a feeding schedule that included BF, pumping and formula. From day one, she had our son on a schedule that we continue to use today, and now he sleeps in 4 or 5 hour stretches at night, at just 5 weeks old. Jerry was very professional, courteous, patient and kind. She arrived promptly every evening and oftentimes stayed a little past her ending time in the morning to ensure I got a shower or to put in the baby’s laundry. Each night she would organize his clothes, bibs, burp cloths, etc. and always made sure to leave his area and our home spotless in the morning. She took pride in readying him every morning and took the time to put him in cute outfits, always asking if we wanted him in something specific for a doctor appointment or if we were having visitors. She had no problem watching him alone so that we could grab dinner or drinks and willingly adjusted her hours so that we could entertain on some nights. Jerry was a dream and her last day was a difficult one – we never wanted her to leave! But the service and care she provided our family was money very well spent. After a month with her, we feel well rested, informed and confident! Paula let me know that I should send you a report now that her assignment with us is concluding. She has been wonderful with the girls. They were small so needed to be woken every few hours to eat- Paula did a great job and our pediatrician has been impressed by how much weight they’ve managed to gain (double their target some weeks). She’s also taught us a lot – most importantly, how to bathe them – but has also has taught me tricks for handling the two when I am home alone (like how to prop one up after she feeds if the other is hungry) and she’s recommended great products that have worked really well when ours weren’t working for the girls (diaper cream, bottles). She has been extremely proactive about helping out with household tasks pertaining to the babies and that help me tremendously. She cleans and tidies their nursery every day, washes all the bottles and my pump parts, takes trash out, puts all their laundry away, and even tidies the kitchen in the evening. All these seemingly simple tasks really add up and I’ve been very grateful for the time it saves me during the day. Lastly, she is consistently early and has never missed a day. We’re grateful for how reliable, upbeat and accommodating she has been — Paula has taken great care of our girls and we would happily recommend her to others. We had to write in to convey the most wonderful experience we had with Anelia as our night nurse. As first time parents, we were nervous for anyone to care with our sweet son. Anelia had a wonderful disposition with both us as cautious parents and more importantly with our son. She is familiar with all SIDs protocols and we also found her to be experienced with many different types of infant care conditions including reflux which was hugely helpful given our son’s reflux diagnosis. She helped us to troubleshoot how to make him more comfortable, as well as to establish healthy bedtime habits. Anelia has a lovely personality and is not at all pushy but glad to offer her point of view when asked which is based on many years of infant experience. Often I would wake up to Anelia playing with our son and doing tummy time in his play yard. We enjoyed having her in our home and can truly say that she helped to make our first several weeks with our little one even more special. We were so thankful to have found her. I would like to give a wonderful review of Ava Hayles. She was our nurse for two weeks after our 3rd child was born. From the moment Ava arrived, she put as at ease and we felt like she was a part of the family. She took care of our son like a baby whisperer, singing, cooing, soothing and loving on him. She also was kind and warm to my other kids who still ask about her. Ava takes good care of herself and her health is important, taking supplements, and eating healthy so she could be in the best shape mentally and physically to take care of a newborn. I really appreciated that. She not only took care of washing, ironing, and all things baby but she also helped in the kitchen. I wish she could still be with us and miss her a lot! We wanted to write you a quick note to commend Veronica Blake. We have been working with her since our daughter was about a week old. Veronica was fantastic at helping our family adjust to newborn life by taking care of her throughout the night and assisting with all the other things (baby laundry, bottle washing, etc.) that the baby needed. She was also great at transitioning our daughter to fewer and fewer feeds overnight, gradually getting her sleep trained where she now sleeps through the night! After she was sleeping through the night, we have been working with Veronica during the day to take care of her and has been great about providing stimulation and entertainment for our baby as well as keeping her on a good nap and feed schedule. We have had a great experience with Veronica and trust her to take care of our daughter at night and during the day. Veronica is a pleasure to work with and I know our baby really enjoys spending time with her! Lullaby – My husband and I wanted to share our great experience with Edmarine Baker. We had the pleasure of working with Eddi for 3 weeks after the birth of our son. We strongly recommend her to any family looking for a baby nurse. Eddi is a seasoned baby nurse and has the EQ and IQ to work with families during this wonderful (but also tiring and stressful) time. What struck me the most was how engaged she was with our son. Eddi was always speaking to him, making him feel loved and it was evident to us she has a true passion for taking care of babies. She taught us many tips and tricks for taking care of him, many which are not taught in baby books. We felt she kept abreast of newborn care techniques and products, rather than just relying on what had always been done. Eddi was also instrumental in helping us navigate the world of baby gear and products, recommending items that would be helpful in our son’s care. Eddi is extremely organized; she immediately got our nursery in order, kept it that way, and helped us establish a routine for keeping her order in place. She went above and beyond just taking care of our son by helping keep our home tidy and cooking us a wonderful meal. She was comfortable making suggestions and professionally offering her recommendation, but at the same time always listened to our preferences or concerns. Most importantly, we unequivocally trusted her with our newborn son. It is not easy to hand over your child to a stranger – especially at night – but the from the moment Eddi walked through our door, her confidence and knowledge put us at ease. We are happy to serve as a reference for Eddi and would welcome the opportunity to discuss our experience further. If you have the chance to work with with Eddi, do not miss this opportunity. HIRE HER!! When Kimberly stepped into our house, she came with a big smile and a breath of fresh air. Days after our second child was born, we let our first night nurse go because it was just not a good fit. We were anxious, tired, and desperate to find someone we trusted to spend our nights with us. I am a very tough judge of character, and I will say that Kimberly is a very special human being. She is not only highly intelligent, but she is emotionally intelligent. She takes great pride in her work, spends her free time reading articles and learning as much as she can about infant care to increase her expertise. Every day she walked into our house with a smile, graciously greeted us, and swiftly and professionally took our little boy into her arms with love and gave us incredible ease that he was in the best of hands and care. Kimberly has become a part of our family in the four months she spent with us. We truly did not want to let her go and if we could afford her to stay with us for a year we would. Our first child loved her so much that her arrival every evening was the highlight of his day and he would run to the door squealing her name. If you are looking for a kind, smart, warm, and knowledgeable night nurse, and you are lucky enough to have found Kimberly, hire her immediately. You will not be disappointed, and you will likely feel like it was a gift during this precious time in your family’s life. She is a diamond in the rough and we hope that she continues to find families that are deserving of her. Please don’t hesitate to reach out to me. I understand how important this decision is, and if I can help you feel ease and answer questions it would be my pleasure. This note is to endorse the newborn care services of Ava Hayles (also known by her nickname of Sandy). Sandy took care of our 3-week old daughter for 4 nights while our regular night nurse was away. Sandy was a calm and nurturing presence in our home. She quickly learned our routine, showed great kindness and gentleness toward our daughter, and put us at ease. Sandy seems to have an intuition for what will soothe an infant at any given moment, whether it’s diaper-changing, burping, stroking, or singing and speaking to the child. With Sandy around, we were able to eat dinner uninterrupted and get stretches of sleep for 3-4 hours between breast-feeds. No small feat! We wanted to send a testimonial to you for Paula as she means the world to us and we want everyone to know how great she is! She is such a special person – we were lucky to have her helping us with Ozzie. We can’t say enough good things about her. But if you ever need any more information, please don’t hesitate to reach out as we would recommend her to anyone we know. Our son, Ozzie, was born with a congenital heart defect and spent 6 weeks in the hospital having had multiple surgeries, before we could bring him home. When we did, we knew we needed help as he had to be fed every three hours and was still learning to eat from a bottle. We were sleep deprived and traumatized from everything we’d been through but Paula came to our rescue and is now a permanent part of our family. She took control and helped us learn how to care for our little man. At a little over 4.5 pounds, he was fragile and yet Paula treated him with such care and love, we knew he was in capable hands. She was patient with him when he struggled to eat (he didn’t like to eat for his parents or doctors, he always ate for Paula!) and was even able to help us give him all his medicines! We ended up keeping her on for months as she helped us get him ready for a second surgery. And when he went in to the hospital again, Paula called and checked on him every day. She really loved him like her own. Paula truly made us feel like it would all be ok. And we were finally able to get some much needed sleep knowing he was in her capable hands. Ozzie loves Paula and so do we. She saved us and helped us believe that Ozzie would be ok in the end – she knew it all along. And to make it all even sweeter, she was amazing at keeping things organized and clean in our home. (We never knew when we would run out of diapers or wipes, Paula constantly had to say “make sure you order diapers today!”). Even better, she’s fun to be around! Paula was instrumental in helping not only Ozzie, but also his parents! We are so grateful to her and she will be part of our lives forever! We had booked Amy well in advance of our first child being born. We had recently moved to the US and did not have any other family supports here. Amy was helpful from the very moment she walked through the door. She is patient and understanding with babies and parents alike. She taught us how to feel confident as new parents in a very short time. We felt like we were constantly learning on the job as she helped us quickly recognize how to do things easier and better, and how to read our son’s cues quickly and effectively. Her encouraging approach helped reassure us that we were becoming the active parents we wanted to be, while at the same time her caregiving, particularly in the first couple of weeks and overnight, helped ensure we were properly rested so that all our time spent with our son was quality parenting time. She is caring and compassionate, while having a baby’s best interests at heart. She is conscientious and timely, reliable and flexible. She is excellent at managing the balance between helpfulness at home, and the privacy that a new family need to bond as well. Amy not only provided us with ongoing help and education during her time with us, but she also gave us advice and suggestions for the future. She encouraged us to contact her with any questions we might have in the future, which is reassuring. We would highly recommend Amy to any parents-to-be, whether this is your first child or you have many already. It was day five of my new baby’s life. I was relieved that the birth had gone smoothly and that my child was healthy, but after 48 hours of caring for our son by ourselves, my husband and I were completely exhausted and feeling very overwhelmed. I had not planned on hiring a night baby nurse, but at my husband’s urging, I sent a message to Lullaby mid-morning. I was not entirely sure what I needed, but I knew I needed some sort of help. Josephine promptly responded, giving me the background and contact information for several candidates (along with references). By that evening, Marlene, the baby nurse whom I had selected, rang my bell. Marlene got right to work. She brought much-needed order into this chaotic time in our lives by establishing a routine for our son, helping us organize our baby’s nursery in a more user-friendly manner, and maintaining daily logs to help us learn about our son’s sleeping and eating patterns. Like many first time moms, I frequently wondered if I was taking care of my child correctly. Marlene was there to reassure me when I was and to correct me when I was not. I consulted her advice on nearly every aspect of my baby’s care ranging from how to hold him when he was fussy to the types of toys I should buy to best develop his senses and skills. Marlene always answered my questions with candor, and she proactively made suggestions based upon her observations and experience. For example, after my son began to sleep in a new crib, Marlene noticed that he was showing signs of discomfort, and was not sleeping as restfully as usual. The next morning, she reported her findings to me, and presented a variety of new mattresses models that she had researched for me overnight. That kind of initiative and thoughtfulness gave us great comfort, as we knew that we were leaving our child in caring, capable hands each night. Underlying all of Marlene’s hard work is her sincere and profound love for children. She quickly developed a wonderful rapport with my son, and he was just smitten with her. She asked after him on her days off. When he was sick, she called or texted throughout the day to see how he was doing. She delighted in him hitting his developmental milestones as much as we did. And she took pictures of his cute moments to share with us when we were not there to catch them. Although I had read a small library’s worth of books and articles on childcare and taken lots of classes on the subject, nothing took the place of the practical knowledge, experience, and care that Marlene brought into our home. She ensured that our son is happy and healthy, and helped us become much more confident parents. She is punctual, reliable, and trustworthy, and was always respectful of our home and time. Marlene would be an asset to any family with children. Dalia has been a wonderful help. At first I was reluctant to have a night nurse, but I’m so glad that we went ahead and got help caring for our newborn baby overnight. Dalia is professional, always arrives early, and is great with our baby. Having her here overnight has allowed me to catch up on sleep and become a better mom during the day. She is clearly comfortable with newborn babies and has provided us with helpful tips! Malika Cameron was a godsend for us. Our daughter was a little over a month early and likely due to that has struggled with reflux whereby she has trouble sleeping on her back. She would sleep on my husband or I but we would get little to no sleep. It was brutal. So we decided to get a night nurse to help us out for a week and a half while the medicine kicked in, and ended up adding another week because Malika was so good. Malika is a complete professional, always arriving on time or early and immediately diving in to taking care of our baby. She has an amazing touch and strikes that wonderful balance between knowing what an infant needs and what they do not. She is also an incredible resource for us first-time parents, as this is definitely not her first rodeo. She was fabulous about giving out tips and gently correcting behaviors of ours that may have led to bad habits. She is very observant and helped me to figure out whether the reflux was worse after breastfeeding or a bottle, and she was always able to figure a way to soothe our daughter when she was uncomfortable. Malika not only took incredible care of our daughter but also us, including shooing me to bed to get rest when I was dawdling about. I cannot recommend Malika highly enough! As first time parents, we were thrilled to have Trishauna from Lullaby Services Agency. Trishauna possesses the qualities that are most important in a baby nurse; knowledge, warmth, and encouragement. She brought with her a wealth of experience and knowledge and was great at educating us throughout her stay. She was clear with her communication. Not only is she technically competent, but has a love for babies that shows. As a mom herself, she cared for our daughter as though she were her own. Trishauna respected our desire for family time; however, always offered her services and assured us she was a second away when giving us said family time. We felt educated and encouraged while learning the ropes as new parents. We would highly recommend Trishauna! My wife and I hired Paula as a nighttime baby nurse for two months, when our baby was 3-4 months of age (summer of 2017). We had a good experience with Paula and greatly appreciated her help in those early months. Being a new, first time parent can be hard and we are quite happy we hired Paula. Paula was reliable, always showing up prior to the scheduled start of her shift. There was only one time she reached out to us that she might be late due to delayed trains and even then she was early for the shift. Paula went out of her way to be helpful and was flexible on additional dates and hours. We found this to be quite helpful as we occasionally would need help a little later in the morning or on a Saturday. Paula has a good attitude and was respectful of any orders or requests. She was diligent monitoring our child at night and reporting to us in the morning. We liked that Paula herself is a mother and has many years of experience as a baby nurse. We found her to be good with our baby and we always felt she kept our baby safe. Paula also allowed us to get more sleep at night, which is definitely a challenge for new parents. We also found that Paula was respectful of our space. We were hesitant on having another person in our home, especially in a small New York City apartment. We found that Paula gave us our space and we didn’t feel that she intruded on our dinner or our time together after the baby was asleep. Paula also was a hard worker. Paula helped us do the baby’s laundry, tidy the nursery, and wash out and prepare the baby’s bottle. We definitely missed Paula when we decided to go solo as parents at night! Best of luck in your journey as a new parent! We never considered hiring a night nurse before, but we were feeling overwhelmed and needed help juggling a toddler and a newborn. Trishuana from Lullaby Services Agency was wonderful–she dove right in to help us with our girls. A mom herself, Trishuana was informative about babies in general, helped us set a sleep and feed schedule for our newborn, Aimee, and was also responsible and reliable. She treated Aimee like her own while also assisting us with our older daughter, Sabrina, by giving her breakfast and bathing her. She has years of experience as a baby nurse for families around the world, and truly loves her job–it’s quite evident! Knowing Trishauna was here to help us put our mind at ease and let mom and dad (and big sis) get some post-partum rest! We definitely recommend Trishuana and Lullaby Services to other New York families. Here is my testimony for Opal. I hope you’re catching up on sleep in NJ! We miss you and appreciate you! When our daughter was 7 weeks old, my wife and I were desperately exhausted. The baby wouldn’t consistently settle down at night and was waking up several times throughout the night, which also meant my wife was waking up, feeding and soothing the baby for at least and hour at a time. Though she was working from home, my wife was still working full time, and I would take care of the baby during the day. We needed help to get the baby into a bedtime routine and give my wife and I some relief for sleep at night. Opal provided just what we needed. The first week: Opal diagnosed that our daughter had difficulty passing gas, which was hindering her sleep and keeping her awake for longer stretches than necessary at night. She recommended that we start on gas drops and gripe water and we made some adjustments to our diet to see if that would help. Within a couple days, the baby started sleeping better. It took a few days to get used to someone taking the baby at night, but Opal quickly built trust and confidence, and we were able to get between 6-8 hours of sleep a night. This made a world of difference in what we were both able to accomplish during the day and allowed my wife and I to reconnect. In addition to helping with the baby, Opal was a joy to get to know. We shared cooking tips, she brought us the best roti and sauce, and she was always professional and upbeat. Just knowing that Opal would be here each night at the same time helped us be disciplined in getting the baby ready for bed at a consistent time. Opal was with us for two weeks, and since she’s been gone, we’ve kept up the routine. Opal introduced us to logging all of the feedings and sleep times in a notebook, and we’ve continued this to keep our daughter on a solid routine. Though Opal was only with us two weeks, she added great value to our family, and we still feel her impact. We’re very grateful! Lullaby connected us with the greatest night nurse turned nanny of all time — Camile Forrester. We had newborn twins: Jack & Amelie. We’re grateful Camile showed us the ropes AND cared for our babies these last past 2 months. Camile is great for so many reasons. Of course she was wonderful with Jack and Amelie, but Camile thought them [and us] to sleep through the night. She knows exactly what to tell us and when. Timing is everything and she didn’t make us feel that we were abandoning out kids if we had to leave for work or run errands. During the day, she totally crushed it with the feedings, diapers, play time, tummy time, nap time and helping to correct Jack’s flat head issues. Hahaha. But Camile was so much more than that to us. We genuinely enjoyed and looked forward to Camile’s company. She is a good soul. We looked forward our conversations where we learned about her loving family and proven methods to raise amazing children. We took note of her values, tactful advice, and her overall expertise. She is not only a nanny, but she is a nurse, teacher, and true friend. We are going to miss Camile dearly. Thank you Camile — and Lullaby! We never considered hiring a night nurse before, but we were feeling overwhelmed and needed help juggling a toddler and a newborn. Trishauna from Lullaby Services Agency was wonderful–she dove right in to help us with our girls. A mom herself, Trishauna was informative about babies in general, helped us set a sleep and feed schedule for our newborn, Aimee, and was also responsible and reliable. She treated Aimee like her own while also assisting us with our older daughter, Sabrina, by giving her breakfast and bathing her. She has years of experience as a baby nurse for families around the world, and truly loves her job–it’s quite evident! Knowing Trishauna was here to help us put our mind at ease and let mom and dad (and big sis) get some post-partum rest! We definitely recommend Trishauna and Lullaby Services to other New York families. Ms. Amy Wilson came into our lives a few months before I was due to have the baby. From our first meeting I felt Amy’s warmth and sincerity and I knew I wanted that energy around when we bring home the new baby. Amy has stayed in contact with me before and after delivery and she was ready to come and stay with us the day we came home from the hospital with our newborn baby boy. From the first second, Amy took control of the baby’s schedule, his feedings, diaper changes, hours of sleep through the days and nights. On the day of circumcision Amy was prepared following the instructions of the Rabbi with Neosporin and double diapers. She cared skillfully for our boy after the circumcision until everything was healed with proper wound care and hygiene. Amy stayed with us for 5 weeks. During that time she refreshed our memory in caring for a newborn and set the baby on a schedule. Amy was excellent with our 2.5 year old daughter, helping her adjust to a new part of the family, get to know her baby brother without feeing left out, and she taught our nanny how to care for the baby. Overall, Ms. Amy Wilson made our lives a joy with her presence and her knowledge of babies and kids. She is also funny and a great cook! We highly recommend Amy to any family who is expecting any number of babies! Sistaciou was a terrific baby nurse and I enjoyed working with her very much. She had a very gentle and sweet and low maintenance, not at all pushy, way of guiding me and teaching me little things. She definitely had experience and an opinion but, unlike I’ve heard about other nurses, was not pushy about it and gave gentle advice if it seemed right and definitely gave advice when I asked. She was a great communicator and very flexible to work with. My daughter Violet was born at 34 weeks and was only 4 lbs when she was released from NICU. It was very intimidating bringing a baby that small home. I also had complication from my delivery that resulted in having to go to the doctor everyday. I desperately needed help and Amy Wilson was the perfect solution. I had originally contracted Amy for two weeks, but I extending her services for 7 more weeks. Amy knows virtually everything about newborns, including premies. I found that the advice I got from friends and family was outdated or just didn’t work. Much of what I found on the internet didn’t provide information on premies. Amy showed me how to complete many of the day to day routines of caring for a baby. She steered me away from some bad habits that might make sleep training more difficult in the future. Amy was also very reassuring, there were so many times where i was unsure if something was normal or if I should call the doctor. She would let me know if it was normal or if was something we could easily remedy without calling the doctor. Having Amy there also allowed me to get some much needed sleep, and allowed me to go to my daily doctor appointments. Aside from all of the services she provides, Amy was very loving when caring for my daughter. She is also easy to get along with, I have a one bedroom apartment and was concerned about having someone in my space that much. To my surprise, it was fine, she is very accommodating. We had such a wonderful and life changing experience with Shakira, the baby nurse who lived with us for one week. Our four month old was in the middle of a sleep regression and we were exhausted beyond our capacity, sleep deprivation since the birth was making me unable to function well. We requested a nurse who could help us get some desperately needed rest and also guide us with some gentle sleep training over the course of a week. Shakira was nurturing, confident, and knowledgable and has since become like extended family. She was incredible with our daughter, and helped us make decisions regarding our baby’s eating and sleeping schedules that have helped everyone. In a matter of days, our daughter was sleeping soundly, and waking only once a night (as opposed to every hour the previous week). We were able to get our rest and sanity back. We joke that a revolution occurred in our family- but truly it feels miraculous and we are all three sleeping better! We look forward to a great relationship with Shakira for years to come and are thankful to Lullaby Services for the connection. I recently had the pleasure of working with Stephanie while I visited New York. I was visiting my family for a month and hired Stephanie to take care of my 6 month old son. She was extremely helpful in settling him in to a routine, as well as, able to manage his every need. Having a difficult son, who had trouble feeding and fussy due to teething, Stephanie was able to manage all his needs with patience and love. She was extremely reliable and always on time and always ready for the day with great enthusiasm. I was able to confidently leave my son in her care for the whole day knowing he was in good hands with someone who not only played and entertained him, but feed him and read to him while I was busy. My son enjoyed his time with her and she was able to take care of him from the time he woke up in the morning to showering and putting him to sleep in the evening. She is an extremely trustworthy and caring individual that made my trip to New York from Dubai a great leisurely trip relieving the stress of traveling with a child so that I could thoroughly enjoy my trip home and spend quality family time. I would highly recommend her and am extremely grateful that she was available during my trip, and I look forward to working with her again in the future. Below please find a testimonial for use on the website regarding Sean’s services. Sean joined our family after we parted ways with our first baby nurse (who was not found through Lullaby!). My husband Jon and I were completely overwhelmed with conflicting advice about how to best care for our newborn daughter from books, the Internet, well meaning friends and family, and our prior nurse. It all had led to a very unhappy three week old baby and stressed parents. Sean entered our home and instantly – and I mean instantly – began to solve our troubles. She taught us so many practical tips and tricks about infant care and, most importantly, how to understand our baby’s cues about what she needs or wants so we can soothe her. Sean brought a wealth of professional knowledge, experience, and kindness into our home that you simply cannot put a price on as parents to a newborn. Sean Monteque-Williams was my nurse for my second child. Her demeanor along with her excellent experience made her a real pleasure to have. Through her great knowledge on children she taught me a lot and I felt confident to take care of my child when she left. She did her job quietly and happily, which made the atmosphere of my home pleasurable. 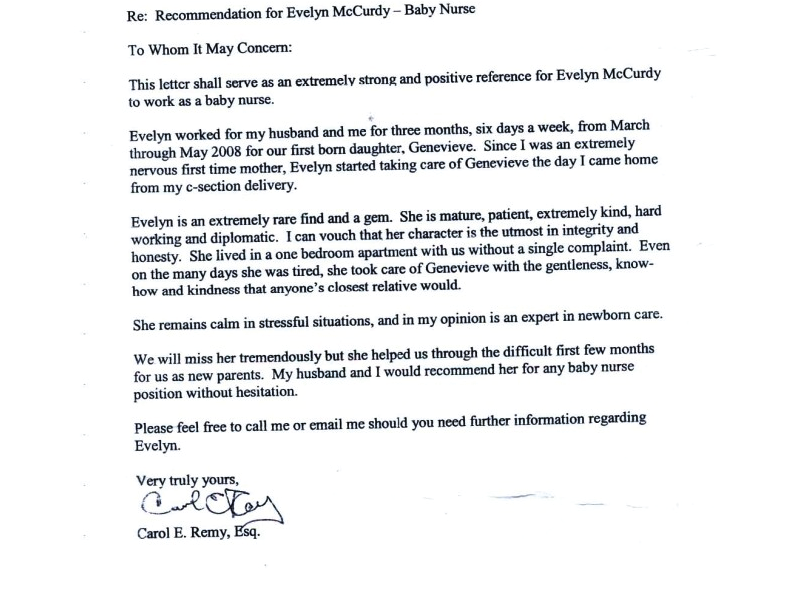 It’s my pleasure to write a recommendation for Vernetta Darby who is an incredible baby nurse. Vernetta taught my husband and I everything there is to know about newborn care and gave us the confidence we needed to handle the job on our own. She was with us for two weeks and worked from 8pm to 8am. When she arrived, we’d immediately start the bedtime routine of bathing, dressing, feeding and putting to bed. She answered all our questions that came up during the day (cutting nails, supplies we needed, baby skin issues, etc) including those around breastfeeding (she’s a lactation consultant). She was incredibly encouraging. My husband and I went to bed around 9pm or 10pm and if there was enough milk in the fridge, she didn’t wake us until 7am or 8am. The sleep helped me heal quickly and also lessened the emotional toll that birth and first couple of weeks take on a new parent. Friends told me about the “blur” that is the first couple of weeks but our experience with Vernetta really enabled us to enjoy the experience and be completely present. We’ve had an amazing experience as first time parents and have Vernetta to thank! Feel free to call with any questions or if you want another glowing review! Andrea worked with us when our older son was born and we called on her when our second son was a few weeks old because my husband came down with the flu and couldn’t be around our kids, and I needed help with night feedings. Andrea is absolutely amazing, she came to our house the night after my husband fell ill and made my evenings worry free-she cared for our newborn so I could concentrate on our older son. She also gave great advice on newborn care even though we are second time parents. 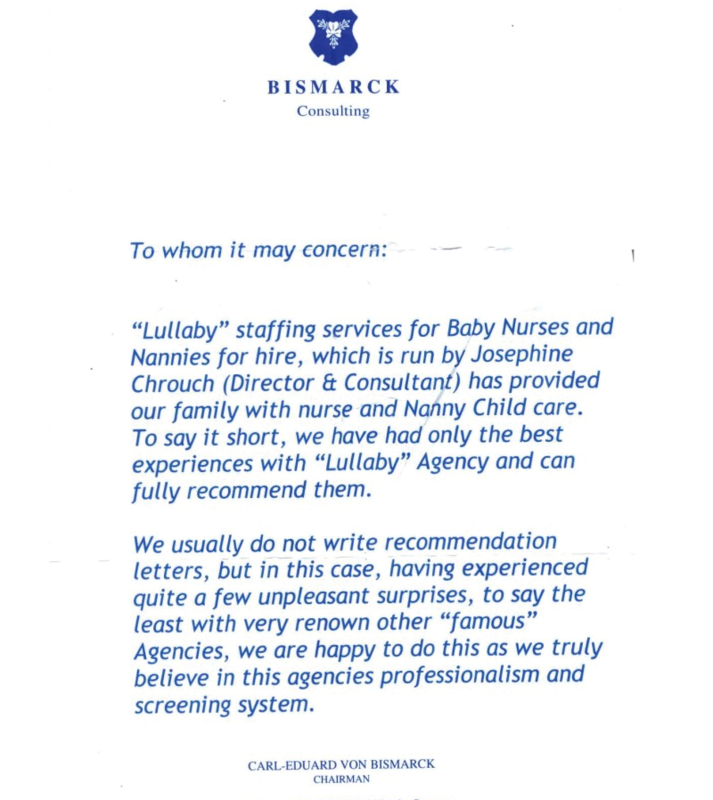 I also have to say that lullaby was great to work with because they were able to help my family out in a pinch. I’d like to provide a testimony for my baby nurse, Glenda Francis. After delivering my first baby, my husband and and I were extremely nervous from the minute we left the hospital. Having given birth 2 weeks early, we were desperate to find a baby nurse not only to help us along this new journey, but also to teach us the tools necessary to be successful new parents. Glenda came to us that first night home, and we couldn’t have been any luckier. As a new mom, I was very hesitant about letting a stranger live with me and help me with my newborn. However, Glenda was warm, caring, and adaptable right from the minute she walked through the door. My husband and I were anxious to learn everything we could from Glenda, and Glenda was ready to instruct us. She taught us everything; from diaper changes and morning sponge baths to identifying feeding cues, breastfeeding, and what to expect in the coming weeks (ie. sleep training). Glenda helped me stay organized and calm, even during our baby’s hardest nights of sleeping. Because I am nursing, I was able to spend a great deal of time each night with Glenda. Throughout our time together, Glenda was extremely easy-going and low maintenance, wonderful to be around, and consistently punctual and respectful of our space. Glenda’s professionalism and kindness are unmatched. Glenda was always anxious to teach me everything about not only caring for my newborn, but also taking care of myself as I recovered from delivery. My husband and I feel extremely blessed to have had Glenda walk into our lives. Not only has Glenda been our baby nurse, but she has also become a trusted friend in our family in just 2 weeks! I HIGHLY recommend Glenda, and am more than happy to speak with any prospective parent further over the phone/messenger/email. Below is a testimonial for Iyeika McKenzie for your website. Iyeika came to us a few nights after our daughter was born. She immediately calmed our nerves as first time parents and was able to soothe our newborn. Iyeika taught us many things we did not know, such as how to swaddle and bathe our baby and how to get her on a sleeping schedule. By the time she left us our daughter was on schedule which allowed us to sleep at night ourselves. Iyeika is very knowledgeable, professional, and trusting. We would highly recommend Iyeika to any family looking for a caring and wonderful baby nurse! We reached out to Lullaby after 5 weeks of having to sleep with our newborn in our arms. Our baby would wake up whenever she was put down anywhere else and cry inconsolably. Needless to say, this wasn’t safe for the baby and we were exhausted. Sandra Goulborne spent 6 days with us and she was truly a godsend. The first night was the hardest as baby woke up repeatedly but Sandra soothed her, singing and talking to her all night long. By the second night, baby was sleeping. It was amazing! Sandra stayed with us until baby had a more consistent sleep routine. I really appreciated the fact that she kept me updated on how our baby was doing and what strategies were working. In addition, Sandra had me try out her strategies for putting the baby down. By the time she left, my husband and I felt confident to continue on our own. It is now a week later and our baby is sleeping through the night! While she still gets fussy around 6-9 (her ‘witching hour’), my husband and I know what is going on and how to help soothe her until she is ready to go to sleep. I can’t thank Sandra enough and highly recommend her to other families! Anelia was the calm in the storm when we brought home our preemie. She is knowledgeable but not overbearing, professional, sweet and attentive. We are not easy to work for and Anelia managed to put us at ease. She got the baby on a schedule and all her things organized. She was a pleasure. Sandra Goulborne spent a month with us after I delivered, and she was an absolute blessing to us. She took care of our baby with the utmost love, often singing or talking to our baby in the wee hours of the morning. Her energy appears to know no limits! She took care of everything, from night feeds to laundry, while I was recovering from postpartum complications, allowing us to spend time really enjoying our new baby. In addition to taking care of the baby, she is an excellent teacher to new parents – patient, kind, and clear – so when she left, we felt fully confident to go on our own. She knows when to step in and when to hang back, allowing us to try it out on our own when we were ready. Not only did she help take care of our baby, she helped take care of me – her emotional support in that first month cannot be understated. If your family is lucky enough to get Sandra Goulborne for even a few days, you’ve hit the jackpot! Camile Forrester came to us as a night nurse when my twins were one month old. She was with us until they were four and a half months old, first just for night and then several weeks full-time as I transitioned back to work and we had a gap in childcare coverage. From the moment we met her, we knew Camile was special. She was fully engaged with both babies, and she quickly figured out how to comfort and care for each of them. My boy twin was the easy one, but my girl twin was a bit colicky. Camile was always calm, even when both babies were crying. She gave them baths every night, fed them throughout the nights, changed them, and cleaned up after them. Our primary concern was the safety of the babies and we never worried when Camile was on duty. Camile helped us to reach our goal of getting the babies to sleep through the night at four months old. She made our lives so much easier during a stressful time when we were getting ready to move. Camile is a pleasure to have around. She’s warm, respectful, punctual, and has a great sense of humor. I would recommend her as a baby nurse to anyone but especially to parents of twins. Alicia always had a smile on her face, regardless of how little sleep that she got. She was very quiet and respectful of our time and space in the house. She very quickly because a welcome addition to our family. Alicia would take Kendall for long, daily walks around the neighborhood. As Kendall got older, they would stop at our local park and put Kendall in the swing that she loved. Kendall started walking at 10 months so these stops at the park would begin to include walking around and playing, all the while making sure Kendall didn’t fall and hurt herself. Alicia is a loving and caring person that has all the skills necessary to care for a newborn, infant, or toddler. Just had to drop a line to Lullaby to tell you about the wonderful experience we had and are still having with our baby nurse Florence. She came to us a few days after we welcomed our twins. We were overwhelmed and in need of help earlier than we thought and she was able to not only take amazing care of the children but give us great advice (which we will be using until they get to college) about their development and well being. Thank you to Josephine for finding us the perfect fit. We consider Flo part of our family. It is my pleasure in writing to say how happy my wife and I are with Ms. Orlene Williams in the care of our daughter, Ziv Jiwon. She is now 25 months old, and she has been helping us raise her since October, 2014. During this time, she has not missed a single day of work, and in fact has been consistently punctual throughout her time with us. In addition, she has made sure to keep us up to date with the daily events of her caretaking with pictures and phone calls. Altogether, she has established a deep bond with our daughter, and has made us feel very happy that we met you two years ago. We feel fortunate that you are with us, and we are pleased to have her with us and our daughter in the time going forward. We would have no hesitation recommending her to other future employers. You may feel free to contact us if you have any further questions or concerns. Camille was an excellent baby nurse. She attended our wedding weekend and took care of our 3.5 month old breastfed son. He did not take bottles well at the time, and was not the best napper. She was able to feed him and get him to nap. We were also able to have our son in our wedding, which was so important to us. Thanks to Camille, he was in good spirits and ready on time for his big appearance. Camille is extremely kind and cared for our son as if he was her own. I worked with Alicia McIntosh (Lisa) for five nights spaced out over the second and third week after the birth of our first child. As a first time mom having Lisa with us during the first few weeks was invaluable. She was loving and caring towards our daughter and very confident and knowledgeable about newborns. She took the time to show us how to do things (like swaddle and bathe the baby) but was never overbearing. She is a punctual, talented caregiver who is lovely to work with. I would highly recommend her to anyone who is looking for some extra support around the birth of their child. It was amazing to be able to get a few hours of sleep knowing that my daughter was in such capable hands. Thank you so much for all you help, Lisa!! We welcomed Sandra into our home as a night nurse when our baby was approximately 4.5 weeks old, and we had wonderfully positive experience with her in every way. Sandra was so caring, and comforting with our son. She took the time to sing to him, talk to him, and really tend to his every need. She helped us out immensely with his night-time feedings and changes, and enabled the rest of the family to get much needed rest. She also tracked every feeding and diaper change so we knew exactly how our son was doing through the night. Sandra was also so patient with teaching us many things, including how to bathe our son, how to properly feed him and burp him, and how to do tummy time. We felt like Sandra became a part of the family during the time she was with us; in fact, Sandra took the time to check in with us even after she had left. We would recommend Sandra without hesitation to any family looking for someone with much expertise and warmth when it comes to caring for newborns. Anelia came to our rescue when our baby boy Alex was about 4 weeks old. Alex was colicky from digestive problems and my husband and I (but especially me) were severely sleep deprived and starting to lose our minds. Anelia worked overnights with us for about 5 weeks. During this time Alex started to sleep better and get into a more organized routine and I was able to recuperate from a difficult delivery and rough first few weeks. He is now a happy, calm baby I am delighted to report- and we are happier, well rested, more sane parents. Anelia was wonderful to have in our home- she is both warm and professional. A lot of baby nurses understand babies but Anelia understands babies AND parents. She made my husband and I feel so comfortable and taught us how to give Alex a bath, different calming ways to hold him, and as he got bigger, let us know when he was ready for different daytime activities, more food, etc. Anelia is kind, intuitive, soft spoken, and never pushy. Anyone would be lucky to have her as a baby nurse. We love Anelia and Alex will miss her as will we! I just wanted to let you know that Sandra was a delight to work with. She did a wonderful job helping us navigate the first two weeks of parenthood. Sandra gave valuable guidance without being overly pushy or making me feel dumb. (I had never taken care of an infant before and had a lot to learn). I really appreciated that she handled all the night feedings, which really gave me a chance to recover from a long labor and delivery. She had some great suggestions about products to get, like a wipes warmer and Dr. Browns bottles. Sandra was very sweet with our newborn daughter singing to her and comforting her well when she was fussy. She seemed to truly care and even called us the day after she left to check up on how things were going. I would highly recommend her to others looking for a caring baby nurse and have already given her card to a friend due in mid August. Just a couple of weeks after our twin girls were born, my wife woke up at 5am on a Saturday with high fever and nausea. She had gotten an infection, and we were certain we wouldn’t be able to take care of our girls by ourselves. We waited until 8am that morning to call Josephine, who sprang into action. By the afternoon Kenisha showed up. She stayed with us for 48 hours and practically saved us. Kenisha is very knowledgable and experienced. During those 48 hours my wife had the chance she needed to rest and recover, the girls were cared for expertly, I even got to sleep more than ever since the twin have been born, and to top it all off I learned new things from Kenisha about childcare and was more confident in my parenting when she sadly had to leave. I honestly don’t know what we would have done without her and without Lullaby services. We’d hire them again in a heartbeat. I am writing this recommendation on behalf of Erline from Lullabye Services. She looked after our 6 week old daughter and my husband and I cannot recommend her highly enough. She is very warm and we instantly felt comfortable with her and daughter adores her. She is both kind and professional. We were comfortable leaving Erline to care for our daughter while we were both out of the house and we have a deep trust in her as a person and a caregiver. She has lots of experience with young babies and this was evident throughout the time she worked for us. Our daughter was always smiling and happy while in Erline’s care and this is a true testament to how great she is at her job. When I first came home from the hospital in late November, the first person I saw in the lobby of my building was my doorman. The second was Norma Wilson. It was such a relief to see her smiling face after an unexpected c-section and a longer than anticipated hospital stay. My milk had just come in, and I told Norma about my wish to breastfeed. She helped me discover my milk and learn to pump. Five days into her stay we were feeding my daughter breast milk only. It wasn’t always easy, but Norma put me on a schedule that worked. With Norma’s guidance, we eased into regular pumping and feeding schedules. My daughter responded to the structure, and even settled into a semi-predictable sleep schedule, sometimes sleeping 4 or more hours at time during the night. Norma also tracked every diaper change and every behavior. This came in handy at our first pediatrician visit. We were able to answer questions about wet and dirty diapers because we had Norma’s log. Norma helped us through many firsts (belly button falling off, first bath, first trip outside on a cold day). She gave us invaluable advice and assurance. She also noticed characteristics in our daughter that we might not have otherwise noticed. For example, Norma let us know that our daughter has very strong hearing. And Norma let us know when we were holding her too much (perhaps spoiling her). When Norma switched from a 24 hour to a 12 hour schedule, we found the good night’s sleep essential. However, Norma is so interesting and easy to talk to that we would sometimes find ourselves caught up in conversation about travel, hobbies, and current events…we actually had to remind ourselves to go to bed! I am happy to say that my husband and I are now confident, (mostly) relaxed parents of a 2 week-old baby, and I’m not sure that this is something I could say if we hadn’t had Norma’s support. I highly recommend her as a baby nurse. She loves babies and knows how to take care of them so well. I can be reached any time to discuss further. This letter is in support of Erline as a baby nurse or nanny. Erline joined us when our daughter was barely three months old. As first time parents, we were very nervous to leave her with anyone, but we were immediately comforted by Erline as she is so warm and nurturing. 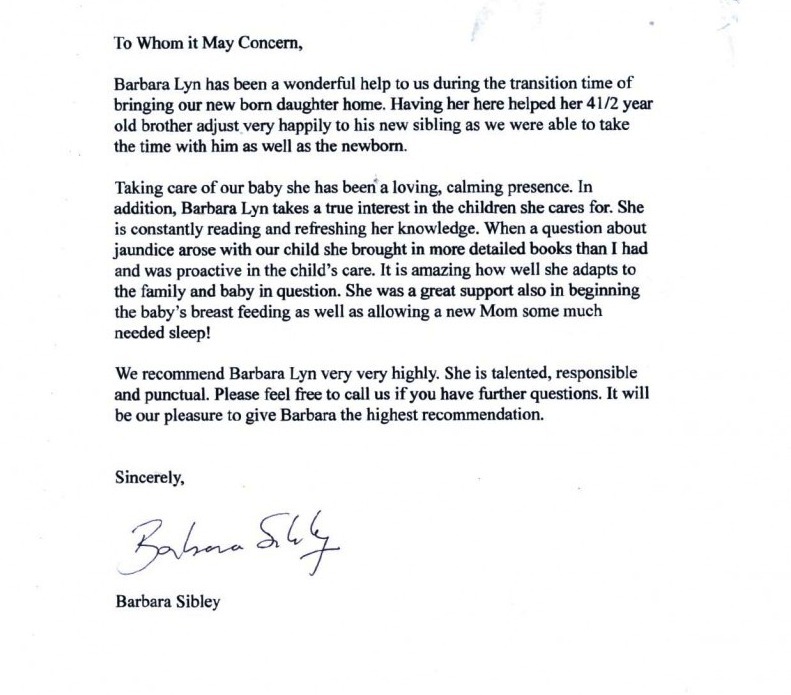 Our most important criteria in selecting a nanny was finding someone who would genuinely care for our baby above all else, and Erline has absolutely delivered on that. Even though Erline has only been with us for four months, our daughter clearly adores her (she gives her a huge smile every time Erline walks in the apartment) and has thrived in her care. Erline has also been a great help to us, offering us lots of advice on how to get her on a good feeding/sleeping schedule and introducing solid foods. We are very sad to leave Erline though understand she cannot come with us to the suburbs. She has been a great asset to our family, and I recommend her without hesitation. Hi, Josephine. I want to thank you for referring Maria Etienne to me. She was wonderful with my little guy and was extremely helpful during my recovery. Maria is very talented and taught me a great deal. As a first time mom, that was greatly appreciated. I am writing this letter of reference for Bennita Clarke, who was a night nurse for my daughter for eight weeks. During this time, I found Bennita to be very competent and caring. Since this was my first child, I had many questions and concerns in relation to childcare, breast feeding, etc. Bennita addressed all of my concerns and more. Setting up the breast pump and the best way to approach bath time are examples of ways in which Bennita assisted me. In relation to schedules, with guidance from Bennita, my baby adapted to a wonderful schedule and stated sleeping through the night by seven weeks old. I found that Bennita was very energetic and used time when the baby was sleeping to wash bottles, do laundry, and help with other tasks that can be tiring for a new mother. Most important though was her knowledge in relation to the proper care of my child. Bennita is very dependable and trustworthy. She respected all of my wishes and interacted with our family appropriately. I was able to go to dinner with my husband on various occasions and not worry about leaving my child in Bennita’s care. Bennita is timely and always showed up for work. During the time she was in our home, her focus was always on the baby and her care. If you have any further questions in regard to this letter of reference, please feel free to contact me. Here is a testimonial about Julie Campbell, who was just fabulous. Thank you for the referral! Julie Campbell came into our house when our son was one week old and immediately showed him warmth and constant nurturing. She stayed up with him during the crazed newborn stages without ever seeming tired. She tended to his every need during the daytime, and organized and meticulously maintained his nursery (even ironing his tiny sleepers). She became a friend to me during my journey into motherhood and always was a calming, relaxed presence in our house. In addition to caring for the baby, she also helped me with household tasks. She was flexible and open-minded–we truly worked together as a team–and she never imposed her views on me. That being said, she is extremely knowledgeable about breastfeeding, sleep training, infant scheduling and care, and I could rely on her advice. She also takes very seriously the fragility of new life and was constantly on guard for our son’s health and safety. As my son grew, he began to absolutely adore her, lighting up when she entered the room. We will all miss her dearly. Sincerely, Rebecca K.
This note is a letter of reference for Viviene James. She was the baby nurse hired by my daughter during a surgery required for one of her daughters. I was greatly impressed with Ms. James in-depth skill and broad knowledge of infant care. She was exemplary in her attention to detail in caring for my infant granddaughter while also being engaging with my 2 year old granddaughter. Ms. James got us on a solid feeding and sleeping schedule with our infant which was essential so that the family could focus on the surgery and recovery of our other granddaughter. She was talented in soothing the baby and insightful in understanding her needs. Ms James was also an able teacher and coach for me as a grandparent. She had just the right amount of encouragement and wisdom in equipping me to take over infant care duties during the surgery period. I greatly appreciate her excellent communication skills and caring lessons. I also want to highlight her flexibility in fitting in with the family. She was easy to be with and a delight to have in the home. I am most please to offer this recommendation as well as speak with others who might employ her services. I can’t speak highly enough about Yvette! I only wish I had had her in the very early days of my daughter’s life. I’m a performer and my baby has never been a good sleeper. I was performing at the Metropolitan Opera in NYC and I hired Yvette to come the night before each of my performances in order to get a good night’s sleep. She did a wonderful job with my older baby (4.5-6 months at the time). She was loving and affectionate, extremely professional and a wonderful communicator, which was important to me. She responded promptly and clearly to any emails or texts and was proactive about communicating. She also did some babysitting for us. My baby loved her! She was friendly and social when invited to be, but quiet and discreet when needed. I can’t recommend her highly enough! Angeloa took care of our second baby for several weeks, beginning about a week after he came home. I highly recommend her. She is was everything we would have hoped for and beyond. She cared for him extremely well–knowledgeably, gently and lovingly. She re-taught us some things and taught us knew things/new ways to think/do old things that were really useful. She helped us keep our daily baby book. giving tips for managing the new dynamic with our older child. She asked us continually what our goals were, to be sure to help us learn to care for our baby and manage our whole family dynamic once she was gone. She gave her opinion but also respected ours. She was really likable and easy to get along with–also important in a NYC apartment! She checked back with us to see how we were doing after she left, and came to visit as well as to babysit a few months later. We consider her to have been a gift and to be a friend. I’d be happy to speak with you if you have any specific questions. Imagine leaving the hospital and having Mary Poppins appear on your doorstep to meet you as you enter the house with your new baby. Our amazing baby nurse, Angie stayed with us for two weeks and basically gave us a crash-course in Baby 101. Angie has worked all over the U.S and Europe and is truly a professional, first-class, caring, funny, and upbeat caretaker. She is a pleasure to be around, and I am beyond sad to see her go. She helped me to heal, making sure I was looking after myself, as well as the baby, after a painful unexpected C-section. I don’t know how I would have survived without her. She helped me with her breastfeeding expertise, setting up a sleep schedule, as well as helping me to decode my baby’s cries. She goes above and beyond helping the mother to cope with the sudden changes of a newborn as well as to care for the baby. If you want to give the best gift for a loved one who is expecting, or treat yourself, Angie is your baby nurse. Angie will help you navigate these exciting, new unchartered waters. You will not be disappointed. You can contact Angie directly at 917-435-4388, and you can absolutely contact me directly for a reference. Just wanted to say thank you for recommending Andrea! From the minute she arrived, I felt more relaxed. She was patient, helping me breast feed and reassured me when I was feeling frustrated. She was also especially great having the baby on a schedule within a day. Andrea is very knowledgable with so many aspects of baby care – she was also a big help with the necessary post Bris care and is a great teacher… As a first time mother, I had many questions and she was always happy to answer them and show me, making sure I understood and was comfortable. Having Andrea’s help made my c-section recovery so much easier and we were so happy with her care of our baby! Viviene James came to our aid in a time of need. Our daughter was 2 ½ months old and my wife was dealing with post-partum depression. We hired Viviene to help us out primarily for the nights and she spent a couple of weeks with us. From day one it was clear Viviene brought with her a lot of knowledge and a ton of experience in caring for infants. We were impressed with the ease and gentleness with which she took care of our daughter. In the first couple of days she was able to understand our baby and her needs and helped us do the same. She was very observant and was quick to make suggestions and adjustments in caring for our baby. She provided us with a lot of information and techniques and communicated this information in a way that was easy for us to understand. Viviene was sensitive to the fact that this we were first-time parents and helped us to get confidence in our parenting skills while giving us simple suggestions in caring for our daughter. It was easy to have her around in our home and in a short time she felt like part of our small little family. Viviene helped us with sleep training our daughter and putting her on a more regular feeding schedule. One night at dinner she said to me that my little one will sleep through the night. We were skeptical that we would be able to get our daughter to sleep through the night at such a young age. However our daughter is now 6 months old, sleeps through the night and is happy as happy can be. We are glad to have had Viviene work with us in our time of need. She certainly did more than what we were looking for and I will certainly recommend her to family and friends.